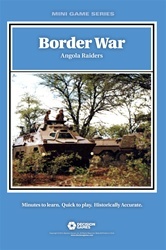 During the Cold War a ruthless conflict was waged on the Angolan border between the South African Defense Force and communist insurgents. Border War is a solitaire game that puts you in the middle of that fighting as commander of a South African battlegroup based on the frontier. You conduct raids into Angolan territory, seize enemy base camps and, just as important, return to home base. The game includes two decks of cards. The Mission Cards provide scenario objectives and the resources with which battlegroups are assembled. The missions are drawn from historic cross-border raids, such as Operations Protea and Modular. You recruit from a variety of unit types, including recon, commandos, mechanized infantry, paratroopers, G-5 long-range artillery, and air support. Border War is part of the Commando mini-game series. Once a battlegroup is organized, you move it across the border. When a force enters certain points an Event Card is picked. Events can include anything from special intelligence information to the appearance of major enemy forces. There�s a range of foes, from SWAPO insurgents and Angolan government regulars to powerful Cuban armored formations. Combat is resolved via a quasi-tactical procedure in which both tactical superiority and firepower play their parts. There are special rules for helicopter reaction forces, PSYOP, and leaders.